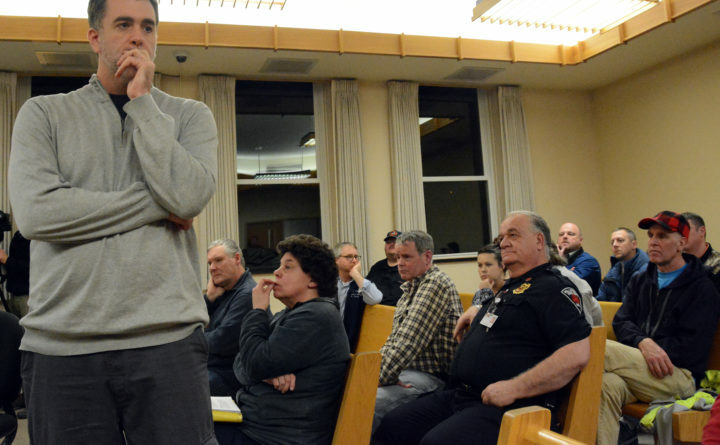 Our Katahdin President Sean DeWitt (left) listens to a question during a 2017 Millinocket Town Council meeting. DeWitt announced Tuesday that the linchpin of Millinocket’s mill site revitalization was not going to locate there. LignaTerra Global LLC of Charlotte had planned the 300,000 square foot factory to produce cross-laminated timber at the legendary former Great Northern Paper Co. mill site, which is now owned by the volunteer economic development group Our Katahdin. But the unresolved lien makes building the plant in Millinocket unwise, said Brien Walton, chairman and CEO of Acadia Capital Management II, Inc., which is helping LignaTerra arrange the project’s financing. “The tax lien prevents significant improvement to the site, including our project, unless it is resolved,” Walton said Tuesday. “LignaTerra was as patient as possible and, although it was very expensive for” the company’s owners, they put their “entire operation on hold for the past 10 months to give Our Katahdin every opportunity to get the site ready for move in,” Walton said. LignaTerra first announced its plans to open in Millinocket in February. As owner of the mill site since January 2017, Our Katahdin is responsible for the lien. It stems from $1.4 million owed to the IRS by GNP Holding II LLC and GNP West Inc., two creations of former mill site owner Cate Street Capital LLC, at the time of the sale to Our Katahdin for $1. The lien also prevents Our Katahdin from receiving federal funds it had previously been awarded by the U.S. Economic Development Administration for the mill site’s redevelopment, Our Katahdin President Sean DeWitt announced on the group’s website on Tuesday. The announcement is the latest setback for a Katahdin-region town that hasn’t caught a break in its 10-year struggle to replace the legendary former GNP mill that made Millinocket one of the world’s leading paper manufacturers decades ago. DeWitt said in the statement. Cross-laminated timber has been used to build mid-rise buildings in British Columbia and the West Coast. He invited Katahdin-region residents to attend a meeting on Dec. 27 at the Katahdin Region Higher Education Center in East Millinocket to discuss Our Katahdin’s progress marketing the site. LignaTerra officials said they would eventually create more than 100 jobs with their factory. The construction of the facility was supposed to begin in July, with manufacturing due to start a year later, in July 2019. The paper mill employed 208 workers when it closed in 2008. LignaTerra remains committed to locating as many as five plants in northern and central Maine, said Walton, who is also a professor at Husson University and director of the university’s Dyke Center for Family Business. The company is in negotiations with several Maine municipalities and looking to announce a location for its first plant in about 60 days, Walton said. LignaTerra’s principals have not ruled out building a plant on the Millinocket site when the lien is resolved, he said. Drawing a CLT manufacturer to the site remains a top priority, DeWitt said. “We continue to actively engage with multiple companies who have selected the Millinocket site as a primary location of interest. These companies include data centers, biorefineries, aquaculture farms, and others,” he said in the statement.